Below are some of our most frequently asked questions about the online EdD program. Applications will be accepted through April. The admissions review process begins January 15, and continues through April or until all spots for the upcoming year are filled. What are tuition costs? Where do I find that information? For information on program costs download the e-book found here; program cost information can be found on page 25. If you are in North Carolina tuition costs will be the in-state rate. What if I have old GRE scores? Unfortunately you will have to retake the GRE if your scores are more than 5 years old. Evaluation of potential students is done based on a number of different criteria and the GRE is one piece of that evaluation. Do you have a Masters program also? We do not currently have an online Masters program.We do have a number of traditional on-campus Masters programs in Kinesiology. Information about those programs can be found here. Do you have to have a Master’s degree to earn your EdD? Yes, you need to have a Master’s degree and 3 years of work experience in the field prior to admittance into the EdD program. What is the difference between an EdD and PhD? The EdD and the PhD are two different degrees offered at UNCG. The EdD in KIN takes a more interdisciplinary approach toward the degree versus the PhD; meaning students will take a broader base of coursework designed to assist them with exploring and potentially solving issues related to professional practice in the field of kinesiology. For example, a person who is a sport and exercise psychologist would not take all SEP type courses in the EdD program but instead would take courses related to leadership, teaching and advocacy that can be applied in their own specialty area. Practical application is an emphasis of this program. Our EdD students will have research training and complete an individual dissertation but the research is not the driving force behind the degree like it is in the PhD. Someone with our degree can go onto to higher education teaching positions, but if the individual’s main goal is to have research as their primary responsibility, this may not be the best option for them. More information on the differences between an EdD and a PhD from the Carnegie Program on the Educational Doctorate (CPED) can be found here: CPED website that includes a consortium of over 80 colleges and schools of education, working together to strengthen and advance the professional practice doctorate (EdD). Additionally, you can go directly to the CPED website for a wealth of resources about the EdD and Scholarly Practitioners. Associate Dean for Health Sciences and Athletic Training Program Director at Piedmont College in northeast Georgia. Tenure-track assistant professor in the Health & Human Performance Department teaching Sports Medicine and Sport Management classes. Chair of the Department of Health and Human Performance and Program Director for the Master of Athletic Training Program at The University of Findlay, Findlay OH. Lecturing Fellow and the Director of Undergraduate Studies for the Dept. of Health, Wellness, and PE at Duke University. What types of careers are current EdD students employed in? Current students are a diverse group of professionals that include faculty, teachers, coaches, administrators, military consultants, and athletic trainers, as well as many other related careers. What kind of dissertation topics are current EdD students exploring? Here are examples of current dissertation topics. Growth-minded Athletes: Do Coaching Feedback Focal Points Matter? The Effect Of An Introductory Strength Training Program On Acl Injury Risk Factors. What happens if I cannot attend the orientation? Are classes taken simultaneously during a semester format, or are they individual classes that are 8 weeks each? Classes are simultaneous. Students have 2 classes per semester each semester, including summer and follow the same academic calendar as the rest of the UNCG campus. The UNCG course calendar can be found here. UNCG requires proof of immunizations for all full-time students. Does this include online students? No, this is only a requirement for students who are physically on the UNCG campus. To read more about immunization requirements see the information found here. Can I remain employed while I do my internship? Can I remain employed while I am in the program? Yes. Our students are all working professionals and our program is designed with this in mind. Will you be busy? Yes. But with good time management skills, it is very doable. The internship takes the place of a 3 credit class (6 internship credits are required but can be taken in separate semesters). As such the internship should only take as much time as a 3 credit course. What kind of professional development opportunities will I have? 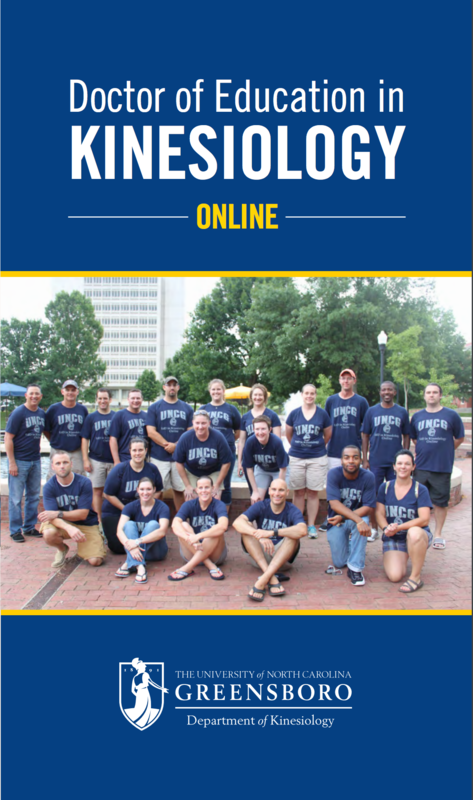 Students have access (via video) to the UNCG Kinesiology Department monthly Colloquium as well as other professional development opportunities that are presented on campus. Students also have professional development sessions specifically designed for the EdD program needs each semester. Is the program synchronous or asynchronous? The program is asynchronous. There are deadlines for assignments in each course, however regularly scheduled common class meeting times are not required to complete coursework. The exception might be for group work, which may require smaller groups of students to find common meeting times using a variety of distance communication tools, like Google Hangout. Students begin and end courses on a semester schedule and go through the program as a cohort. Are there any restrictions on applying depending on where I live? UNCG worked toward changing the Authorized Provider agreements with states, and now all states are approved. What does the four year program schedule look like? Have news to share with alumni or fellow students? Complete the form here as well as the release form here. Please see Visual Overview below of how to complete the Doctor of Education in Kinesiology Online.